Meg and Jack White at the 2007 Primavera Sound in Barcelona, Spain. The White Stripes war an American rock duo, formed in 1997 in Detroit, Michigan. 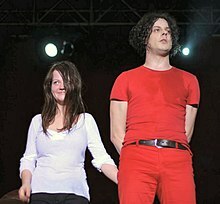 The group conseested o the couple, married at the time, Jack White (sangwriter, vocals, guitar, bass an keybuirds) an Meg White (drums an occasional vocals). ↑ Leahey, Andrew. "The White Stripes". AllMusic. Retrieved December 31, 2011. ↑ "THE WHITE STRIPES". whitestripes.net. This page wis last eeditit on 5 Apryle 2017, at 00:26.